Indeed, several people had told me that when I got my “Loco Hominy Quicky” breakfast, I had missed two better items on the menu: the Chicken Fried Steak (shown at right), and the pancakes (shown below). I’m happy to report that I’ve since been back to the Pines, multiple times (I’m in Palmdale for several weeks for business), so I’ve had a chance to much more fully explore the menu. The chicken fried steak was one of the most excessive breakfast I’ve ever had that didn’t include the words “All You Can Eat”: Chicken Fried Steak, home fries, three eggs, biscuits, and gravy (lots of gravy), from the Pines Cafe, for $9.75. This dish was what Chicken Fried Steak is supposed to be: tender, meaty steak of non-dubious heritage, a juicy interior, and a light and well-crisped batter. The cream gravy was a perfect match as well. The rest of the breakfast was, actually, somewhat superfluous (I didn’t eat for a whole day after eating this), but the potatoes were good as normal (I’ve since found that they also have shredded hashbrowns, I’ll try those next), and both the biscuits and eggs well executed. All-in-all, one of the best examples of CFS I’ve had, and probably the best in CA. The pancakes (at right), were, by the slimmest of margins, the second best pancakes I’ve ever had (first place is still Al’s in Minneapolis, although I’m stunned how close this was), causing a seismic shift in my top-10 list (scarily, the top 10 list had a new entry earlier this month with my visit to Robie’s in Hooksett, NH). 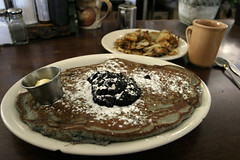 This pancake (which is almost 12″ long) was simply stunning: a perfect buttermilk batter, with good blueberries, the perfect firm-but-fluffy texture, a perfect crisp around the edges, and a really good blueberry compote on it. So my sources were right, both of these items *were* that much better than the excellent Loco Hominy Quicky I had in December. I’m sold on this joint. I wish I could, but I’m only a periodic visitor to Palmdale. The Pines unfortunately closed several years ago, much to the sadness of many regulars. Yeah, I knew that. Somehow, I forgot to mark these as closed.